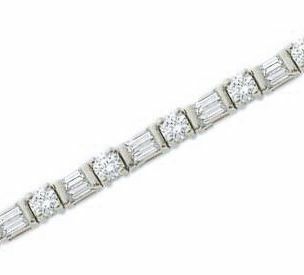 The smaller version of the Delmar .25 Carat Each Round Cubic Zirconia Alternating Baguette Bracelet promises a timeless elegance that is always in style. 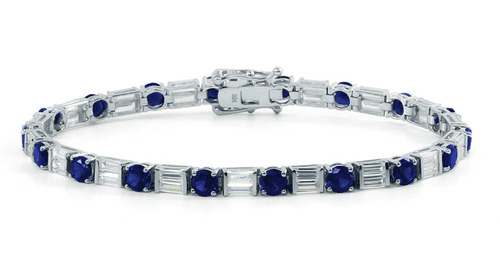 Basket set .25 carat 4mm rounds are elegantly placed between a pair of channel set baguettes. A double-hinged safety clasp secures this flexible bracelet with approximately 6.5 carats in total carat weight of the finest hand cut and hand polished original Russian formula cubic zirconia. The round shaped stone is available in man made ruby red, sapphire blue, emerald green and canary yellow, pink or diamond look cubic zirconia. 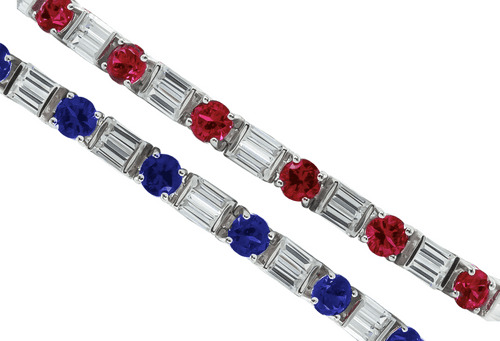 This bracelet comes standard in a 7 inch length and an upgrade to 8 inches is offered. 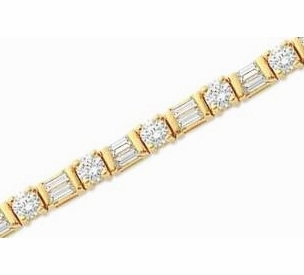 Choose from 14k white gold or 14k yellow gold, please see the pull down menu for options. For further assistance please contact us directly at 1-866-942-6663 or visit us via live chat and speak with a knowledgeable representative.